When to cut back Penstemons in the garden? Easter time or just after the last bad frost in the spring. The top growth helps protect the plants over winter if left in place. Plant with the rhizome visible. These Iris require a good sunny site with reasonable drainage. Baking the rhizome in the summer sun will initiate flower buds for the next season. Yes we still accept cheques as a form of payment. Simply just email us and we will send you our address to post the cheque to. Don't forget to add postage to you order. See Buying from Us for postage rates. Once the cheque has cleared we will send the goods. No we are not VAT registered, so the prices you see are the prices you pay! Do you accept card payments on a secure site? Yes, card payments are taken through paypal and not ourselves. We do not see your card details, once you have completed your transaction through paypal we receive an email to say we have received a payment. 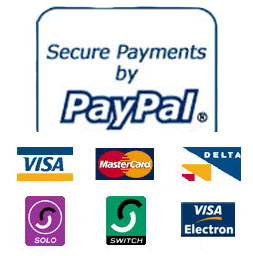 You can pay using Visa, Mastercard, Delta, Maestro, Switch and Visa Electron. You can also pay using your paypal account if you have one. What keywords should I use in the search box?